The Time Machine "Vanilla TX" Basic Track System comes with a Time Machine TX, starter accessories: nylon carrying case, manual, charger, RS232 download cable with 9 pin adapter, two grip switches, one single lane grip switch adapter for lane #2, and 2 rolls of printer paper. Two year warranty, parts and labor. The time machine is unlike any other sports timer on the market. It is sophisticated enough to handle every type of racing event: from neighborhood fun-runs to the New York city marathon to the America's cup to the Hawaii marathon. It's tougher and faster than any other timer, yet it's as easy to use as a calculator. WHAT IS THE TIME MACHINE ? 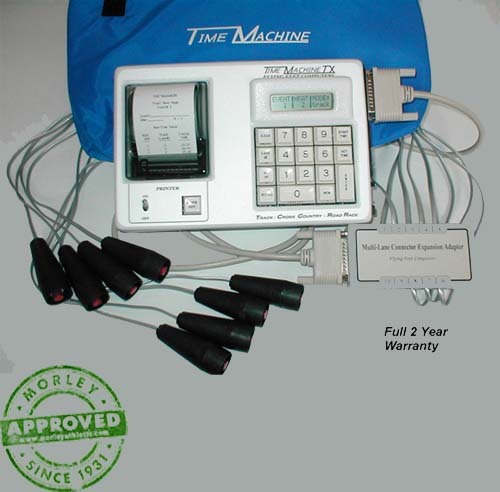 The time machine is a computerized sport timer using an accurate timing crystal and capable of timing up to 10 lanes simultaneously. It uses a DSP (digital signal processor) chip to store the operating program with enough room left over for 8000 times and associated bib numbers. The time machine model m16389 specializes in road racing and provides a "lap timing" mode with splits and cumulative times as well as a "lap training" mode for coaches to control up to ten lanes of timing from the keyboard. The model m16390 builds on the m16389 road race abilities and adds track, cross country scoring and swim timing among other capabilities. Times can be entered via grip switches or keyboard (10 key, touch), start is recorded by grip switch, keyboard, or sound transducer (gun sensing microphone). Bib numbers and menu choices for setting up the time machine are entered via the keyboard. Inputs are displayed on the liquid crystal display (LCD) as they are entered or recalled. Deletion of times/bib numbers requires a five step key sequence to prevent accidental loss of data. All data is preserved when time machine is turned off. The keyboard is not only used for data entry, but also to select appropriate timing methods or "setups" from the menu appearing on the LCD. A multi-lane adapter allows connection of up to ten extra grip switches (which may be lengthened using standard telephone jack cable). Control of the grip switch setup is done from the keyboard. Timing mode, (cross country, lap timing, lap training, track, or swimming), cross country scoring, computer communication settings, are also set up on the keyboard. All setups are saved in non-volatile memory for repeated use. Times/data can be downloaded to computers using such programs as Runscore, Hytek, apple Raceberry jam, track on a MAC, and others. For IBM compatible pc's, connections are included: for MACs, modem or printer cables are used with supplied adapter and cable. Data is downloaded as it is recorded or may be retransmitted (by event number) at a later time. The time machine uses lead acid batteries that like to be recharged often and have a predictable discharge rate. This allows the time machine to turn off the printer when the voltage gets low, but continues recording times for the next 2-4 hours. You may charge the time machine while operating or operate it from a vehicle (12 v.) Battery. Batteries may be replaced by the user by a simple solder joint at two connections, or, for a nominal fee, we will do it. The time machine allows you to register up nine multiple or "wave" starts. Ability to change the event or chute/lane number lessens the need for multiple timers. If the race is so large or spread out that you have to use more than one timer, the time machine can synchronize itself to other time machines prior to or during conduct of the race. Also, for the computer enhanced user, the time machine may be controlled by the download (or "host") computer (the connection works both ways! ).